Join novice vet, Paul Mitchell, in a further six months of hilarious escapades he experiences while working at Prospect House Veterinary Hospital. He’s confronted by a ravenous pig while sunbathing naked in a cornfield. He locks jaws with a caiman with scale rot and battles with Doug, a vicious miniature donkey that’s always sinking his teeth into him. It ends with a Christmas pet blessing which erupts into pandemonium as frightened pets and owners scatter through the pews. Throughout his adventures, Paul is loyally supported by the team at the hospital – in particular Beryl, the elderly one-eyed receptionist, and, Lucy the junior nurse – together with whom he shares this merry-go-round of mayhem. It’s a gripping, fast page-turner that’s guaranteed to keep animal lovers entranced. Amazon review…What a book! I was chuckling from the first page and didn’t stop. Endless imaginative writing to highlight the tussles between the young vet, Paul, and some out-of-the-ordinary pets. Add to it, the romance between Paul and the nurse, Lucy, descriptively ending the novel in a snowy wintery scene with Paul’s spaniel, Emily, leaping around them with woofs of sheer joy. Wow. Simply spine tingling. I challenge anyone not to feel better for reading this wonderful book. More please. 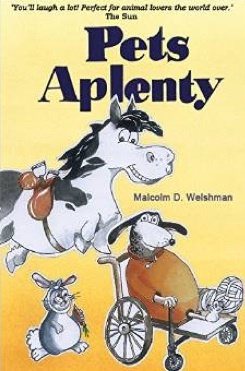 Malcolm is a retired vet who had a novel called ‘Pets in Prospect’ published in 2006. ‘Pets in a Pickle’, published in May 2011, is a new edition of the same book. In it, there are quotes by Sir Terry Wogan and Richard Madeley. James Herriot’s son wrote a foreword in which he kindly compared Malcolm as being similar to his father. In September 2011, the ebook reached number 2 in Kindle’s bestseller list where it stayed for two weeks. The sequel, titled ‘Pets on Parade’, continuing the exploits of the young vet, Paul Mitchell, was published 2nd April 2012. At the end of August 2012, Barnes & Noble in the US chose Pets in a Pickle as its Free Friday selection from their Nook books. As a result the ebook got 68,000 hits and 450 reviews, over half of which were 5*.